Our team of Coaches are led and trained by our Chief Trainer, Tony Loo. Coming from a leadership filled career, Tony is no stranger to Coaching. He obtained his Advanced Coaching certificate in Coaching and Facilitation with Kaplan Singapore and National Coaching Accreditation Programme (NCAP) with the Singapore Sports Council. With the skills obtained, he advanced swiftly through the fields of Coaching being Chief Trainer in Leadership and Skills Training programs with Corporate Organisations and Schools. 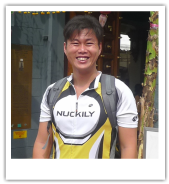 With Biking Singapore, he created the key training model in our Learn to Cycle Class, which allows participants to master the skills of Cycling within 2 classes without falling. Quoting his words, ​the learn to cycle class has to be efficient, fun and as painless as possible for the participant; both physically and mentally. Khabir or Bear, as his fellow coaches fondly calls him, is the Senior coach of the company. His experience as a seasoned cyclist earns him the know how to apply the right techniques to the classes. ​His patience and enthusiasm would surely rub off on you and motivate you further. Be it the Adult Cycling Class or the Children Cycling Class, Bear would definitely be a coach to bring you through the success in learning how to cycle! We are here to help you achieve your goals. Visit our Cycling Class FAQ Page or feel free to contact us on our Contact Us Page. 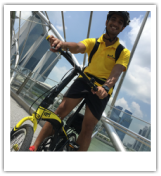 Our Services includes Cycling Experience and rental of Bicycles to tourist visiting Singapore. Local residents can enjoy our Cycle-To-Work services when they explore Bike Commuting.